The machine body is in a tank form and is made of Iron and fitted with ¼ h.p., double shaft, 1440 rpm single phase 220 volts motor AC-50 cycle. One end of the shaft holds the cutting blade in a specially provided washer. The other end of the shaft holds the Grinding Lap. The machine is fixed with a coolant splashguards; the coolant is stored in the tank body for sawing. 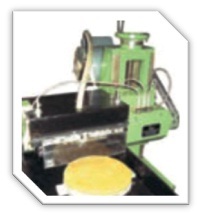 A separate coolant container stand is provided for keeping the coolant for use in Grinding. The cutting blades or Grinding Laps are not provided with the machine. 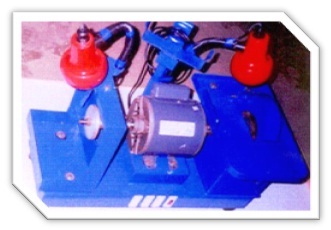 The machine is supplied with light arrangement and belt protection guard. The motor rotates both the Grinding Lap and the Cutting Blades simultaneously. This machine has been designed keeping in mind the budget buyers and works as a combination machine for Grinding and Slicing. It is not advisable to perform both operations at the same time. Ideal machine for persons who do not want to buy two machines but want to perform both functions.